Molten lava cake – is it worth making from scratch? I have been meaning to do a molten lava cake post ever since I did the taste test on mug cake which apparently is a (very distant) descendant of molten lava cake. I was so disappointed with mug cake that I made it a point to remind myself of the original decadent (and high end) dessert that it was based on. I have made molten lava cakes once before (as part of a supper club where everyone had to try a new recipe) and the results were amazing. Mind you, since making them from scratch (several years ago) they have become increasingly popular and I now see them available in pre-made/frozen versions at the grocery store. I don’t recall lava cakes being that difficult to make. Could the frozen variety be an acceptable alternative? For this taste test individuals sampled the Decadent Molten Lava Cakes by President’s Choice, the Sensations by Compliments Molten Chocolate Lava Cakes as well as molten lava cakes made from scratch. The recipe and details on the process can be found on another post. 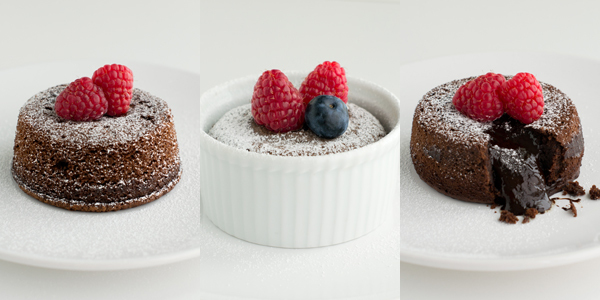 Try each of the molten lava cakes and comment on texture and flavour. Which one do you like the most? Or do they all taste equally good? The taste panel commented that A and B tasted similar with C tasting not as sweet and more bitter from the bittersweet chocolate. Some taste testers preferred the taste of A over B and vice versa saying that one tasted more ‘processed than the other’ or ‘out of the box’ but which one tasted more commercial depended on who you ask. The two people who chose C have a tendency to choose homemade items because they prefer things that ‘don’t taste as sweet’ and have a ‘cakey texture’ that is reminiscent of cakes they ate growing up. One things is for sure, the store bought lava cakes did taste a lot sweeter (so much sweeter that the homemade version tasted a little bland when compared side by side. I can see why children these days are brought up craving those packaged foods, they have the great ability to really hit that sweet spot where the flavours are really enhanced and pronounced. However, if you weren’t trying the lava cakes side by side, no one would really point fault at any of them. I hate to admit it but the store bought lava cakes really are a great convenience and time saver. The price that they are sold at is comparable to what it would cost to buy the raw ingredients if you were to make them from scratch (plus it saves you from doing all the work). The store bought versions also come pre-packaged so you can just chose to make one serving and enjoy it without having to make an entire batch. And you can also microwave the storebought versions. Lava cakes in 50 seconds, you really can’t beat that. Forget mug cake, frozen lava cakes are the way to go! C: Firmer than the others, good flavour. More cakey which I like. I like this one the most. A & B: These are very similar in taste and texture. Both of them are good. Can I have the recipe? C: I don’t like this one. A: Didn’t like the flavour. Good texture and runny-ness. I wouldn’t choose this though because the flavour doesn’t do it for me. It tastes pre-packaged/out of the box. B: Great flavour but a bit mushy. I like this one. C: Good flavour but a bit too dry. I would prefer this one if it was a bit runnier. A: This one is the best. Creamy and rich. B: This one is second best. Creamy and rich. C: This one is third best. Not as sweet or creamy. However, if I wasn’t tasting them side by side they all taste good! I actually think that C is store bought because of the uniform appearance but I liked it the best. Probably because it tasted the least sweet and I prefer that. I choose C.
A: Smooth, creamy, fudgey. More smooth. B: Sweeter than A. More fudgey quality. Sweet taste. I like this one the most. C: Bland. Not as chocolatey.